With an eye on the ensuing Lok Sabha elections slated for 2019, Bharatiya Janata Party (BJP) national president, Amit Shah arrived in Guwahati on Sunday. He is attending the third conclave of NEDA at Srimanta Shankardev Kalakshetra in Guwahati on Sunday. 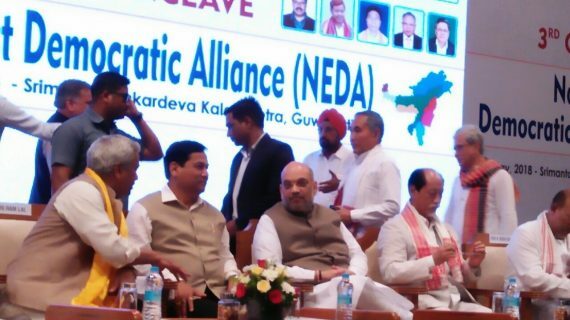 The third political conclave of the North East Democratic Alliance (NEDA), a platform of BJP and its nine regional alliance parties of the Northeast, is being held in Guwahati on Sunday. Earlier, BJP national president Amit Shah was accorded a warm welcome by Assam Chief Minister Sarbananda Sonowal at the Lokapriya Gopinath Bordoloi International Airport at Borjhar on the outskirts of Guwahati early Sunday morning. Shah drove straight to the venue of the NEDA conclave from the airport. According to top BJP sources, the NEDA political conclave in Guwahati is being organized to draw up strategies for the upcoming Lok Sabha elections. The BJP is eyeing to rope in as many as 21 seats among the 25 Lok Sabha seats in the north-eastern region. 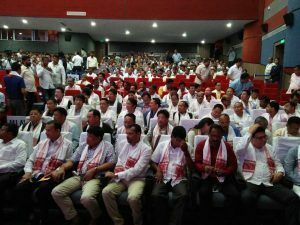 Notably, barring Sikkim Chief Minister Pawan Chamling and Mizoram Chief Minister Lal Thanhawla, all the other chief ministers of north-eastern states are participating in the third political conclave of NEDA in Guwahati on Sunday. They are Arunachal Pradesh Chief Minister Pema Khandu, Nagaland Chief Minister Neiphiu Rio, Meghalaya Chief Minister Conrad Sangma, Tripura Chief Minister Biplab Kumar Deb and Manipur Chief Minister N Biren Singh, apart from Assam Chief Minister Sarbananda Sonowal. Around 120 office-bearers of the Assam BJP unit including ministers and legislators are attending the NEDA conclave at Kalakshetra. On the other hand, BJP in-charge for the Northeast, Ram Madhav, national general secretary of the BJP Ram Lal, Union Minister of State for Home Affairs Kiren Rijiju, Northeast Zonal Secretary of the BJP Ajay Jamwal, Asom Gana Parishad (AGP) president Atul Bora, NEDA convenor Himanta Biswa Sarma, Bodoland People’s Front (BPF) supremo Hagrama Mohilary, former Forest Minister of Assam Pramila Rani Brahma are among those present in the NEDA conclave. Several parliamentarians from the north-eastern region including Union Minister of State (Independent Charge), Railways Rajen Gohain are also attending the NEDA conclave.